Anyone who gets picked to deliver a keynote has got to be a good speaker, right? This speaker was a good speaker and it showed in a number of the ways that he gave his speech. His work experience came from the gas and oil exploration industry. What this meant is that he had a lot of very good stories. However, that’s only the half of it – he was also a very good story teller. Throughout his speech he worked in personal stories that reinforced the point that he was making. Soon the audience was anticipating his next story. His delivery style came across as being strong and confidant. His voice boomed out from the podium and there was no problem hearing him as he spoke. Clearly he had given this speech before and his delivery style was polished, not hesitant. As he gave his speech, he looked at and spoke to the audience. He may have been using notes, but it sure didn’t show. His eyes remained on the audience during the entire speech and every member of the audience was left with the feeling that the speaker had been talking directly to him during the entire time. No speech or speaker is ever perfect and, of course, this speaker was no exception. One of the biggest mistakes that he made was that he was unsure of where to stand during his speech. The stage setup was a bit unusual for this speech. 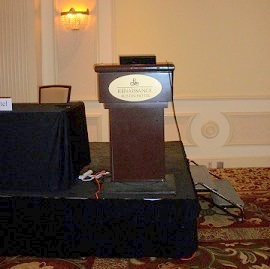 The podium was off to the left of the stage and the rest of the stage was taken up by a row of chairs that had tables in front of them – it was set for a panel discussion. The speaker desperately wanted to pace while he was talking. This is exactly what he ended up doing. However, from the audience it was a bit odd to see the speaker walking back and forth behind a row of chairs and tables. What he should have done was to remain behind the podium so that we would not have been distracted. What to do with your hands is always a question that every speaker has to deal with. This speaker did an effective job of using his hands to make gestures that supported what he was saying. However, when he wasn’t making gestures he had the bad habit of putting his hands into his pockets. I was sitting off to the side and this was pretty distracting. Finally, although the speech was good, the ending seemed rushed. We were traveling along at 60 miles-per-hour and then all of a sudden we pulled off to the side of the road and stopped — the speech was over. The speaker needed to have done a better job of winding the speech down and making his final points. As speakers, we would do well to learn from the efforts of other speakers. Every time we see someone else give a speech, we should watch them carefully and take good notes. In the case of the keynote speaker that I had an opportunity to watch, he did a number of things very well. Chief among these were the compelling stories that he told – when he was doing this he was able to completely hold the audience’s attention. There were several areas that he could have improved on. The one that stood out the most was the fact that he didn’t know where to stand while giving his speech – he ended up pacing back and forth behind chairs on the stage which was very distracting. Question For You: Do you think that you should ever offer suggestions on how to improve to a speaker that you’ve just gotten done watching?